This cleaner removes oil, dirt, and belt marks from the ball's surface. It also revives natural tack to the ball surface for ultimate lane gripping power. With a bio-degradable lemon/lime sented formula, and slower drying gel formula for deep cleaning, this cleaner has been approved by the USBC for use on all high-performance bowling equipment even during competitions. By LJ from Carson City, Nv. Swear by this product still using equipmt. 15 years old and they havent cracked or lost their reaction. I have been searching for a product to remove these pesky belt marks from the ball return at my bowling center and I was recommended this product from a rep. at hammer bowling.com. A little bit of this goes a loooong way, maybe a drop per side. works best with a ball spinner and a microfiber towel. down side is that it takes some pressure to remove belt marks with this product but it does work. leaves a tacky surface, add some clean n sheen or factory finish polish on it and you will be hooking like a champ. I've used my own mix of alcohol & dawn, I've used another brand of equal cost to clean my balls and used clean and dull after each and was amazed at the amount of oil and dirt the came off after I used clean and dull, it's like having a new ball every day. Hello! In the description of this cleaner it states that this cleaner removes oil, dirt, and belt marks from the ball's surface. It also revives natural tack to the ball surface for ultimate lane gripping power. With a bio-degradable lemon/lime scented formula, and slower drying gel formula for deep cleaning, this cleaner has been approved by the USBC for use on all high-performance bowling equipment even during competitions. 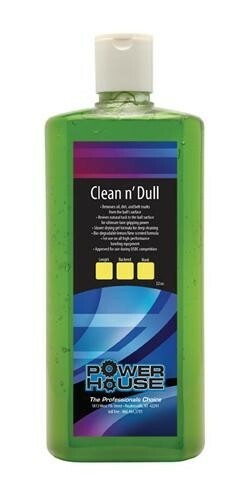 Due to the time it takes to produce the Powerhouse Clean n' Dull Quart ball it will ship in immediately. We cannot ship this ball outside the United States.